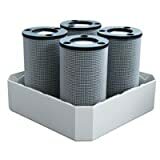 This set of four replacement gas cartridges will keep your IQAir Dental Pro delivering the quality purification you depend on. The cartridges last up to three years, for countless appointmentsa worth of freshness! Featuring 5.5 lb. of activated carbon, the gas cartridges contribute to the Dental Proas multilayer purification, eliminating gaseous contaminants and odors.